Over the years I’ve reviewed a number of TV tie-in novels for shows I’ve either only seen one or two episodes of. Examples include tie-in novels for The Young Rebels, Nancy and The Americans. I’ve also reviewed a handful of tie-ins for TV shows I’ve never seen at all, like Land of the Giants, Mannix and The Mod Squad. Obviously, if I’m not very familiar with the television series I can’t really say whether a tie-in novel does a good job capturing the tone of the show or the characters. I wish I was more familiar with Bridget Loves Bernie because Paul Fairman’s tie-in novel is so ludicrous that I can’t believe it accurately reflects the series. The 1972-1973 CBS sitcom was cancelled after one season despite terrific ratings, reportedly due to controversy relating to the interfaith marriage of the title characters. 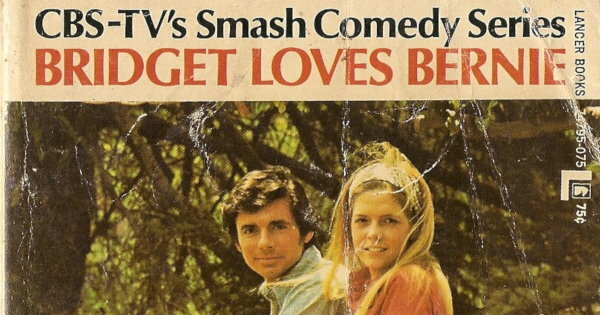 Bridget Fitzgerald (played by Meredith Baxter) was from a wealthy Irish Catholic family while cab driver Bernie Steinberg (played by David Birney) was Jewish and his parents ran a deli. I honestly can’t recall if I’ve ever seen an episode of the series. I think I’ve seen one episode but if I have, I don’t remember anything about it. From what I’ve read, episodes of the series were a little quirky, maybe a little too cutesy for some viewers. The plot of the tie-in novel involves a United Nations protest, multiple kidnappings (but only one for ransom), and a bizarre subplot having to do with a pigeon. Bridget, as portrayed in the novel, is kind, inquisitive and incredibly naive. Most of the action centers on her, Bernie’s Uncle Moe and his friend and fellow cabbie Otis. Bernie doesn’t have much to do other than drive his cab and work on writing a play. Both sets of parents are relegated to background characters, particularly Bridget’s mother. At one point, after Bridget has disappeared without anyone really noticing, both Otis and Uncle Moe manage to get themselves kidnapped alongside her. The kidnapper, a college student named Cliff, is deceptively strong but also a nice guy who keeps taking trips to the deli to buy sandwiches for Bridget and the others. He’s eventually convinced to let them go for a paltry sum, leaving Uncle Moe and Otis to try to track down the mastermind behind the kidnappings. I’m assuming that Paul Fairman didn’t have much to work with while writing the novel. Although there’s no specific publication date I would guess it was on sale around the time the series premiered in September 1972. He was probably using scripts and other production material rather than completed episodes. That doesn’t really explain why the character of Father Michael Fitzgerald, Bridget’s brother, doesn’t appear in the novel at all. Fairman wrote a number of other TV tie-in novels for shows like That Girl, Love, American Style and The Partridge Family, none of which I’ve read. For anyone interested, Bridget Loves Bernie was released on DVD in December 2012 by Sony Pictures Home Entertainment. My recollection is that that show was pretty forgettable. And you deserve a medal for getting through that book. I just saw a few minutes on youtube and dailymotion. The whole pilot is up, but I couldn’t get through more than 5 minutes of it! Can’t imagine the book! The show itself was silly fun at best, and yes, it could get cloying at times. If you’re curious you can watch the premiere episode via YouTube I think. I watched this show a few times precisely because it was between ALL IN THE FAMILY & MTM. The tie-in novel doesn’t sound like anything I remember. The show did defy stereotypes by making the Irish-Catholic family rich and the Jewish family working class.